Fisiceoir teoriciúil Briotanach ab ea Stephen Hawking (8 Eanáir 1942 – 14 Márta 2018). Bhí obair mhór déanta aige i réimse na cosmeolaíochta agus maidir le himtharraingt chandamach. Bhí sé aitheanta ag fisiceoirí mar shaineolaí ar na dúphoill. Chruthaigh sé go n-astaíonn dúphoill radaíocht (atá le brath ar threalamh speisialta eolaíochta). "Rí na Cruinne" an leasainm atá air. Bhain sé clú agus cáil amach i measc gnáthléitheoirí lena chuid leabhar faisnéise, go háirithe A Brief History of Time ("Gearrstair an Ama"). Is leabhar cliste é, a leagann a chuid teoiricí amach ar bhealach simplí intuigthe don léitheoir. Bhí staidéar déanta aige ar thús na cruinne, agus ar an tionchar a n-imreoidh an fhisic chandamach ar a cinniúint. Cé go raibh an t-uafás gradam faighte aige, ar nós Bonn Albert Einstein 1979, Ord Impireacht na Breataine (Ceannasaí) 1982, Duais Wolf san Fhisic 1988, Gradam Phrionsa Asturias (1989), Gradam Eolaíochta an Phobail (2006) agus Bonn Uachtaráin na Saoirse (2009), ní raibh duais Nobel bronnta air. Rugadh Hawking ar an 8 Eanáir 1942, in Oxford i Sasana (300 bliain go baileach i ndiaidh bás Galileo). Frank agus Isobel is ainm dá thuistí. Bhuail siad le chéile roimh thús an Dara Cogadh Domhanda, agus bhog siad ó Londain go hOxford ar mhaithe le sábháilteacht ón Luftwaffe. In ainneoin ganntanas airgid, d'fhreastail siad beirt ar Ollscoil Oxford. Rinne Frank staidéar ar leigheas, agus rinne Isobel staidéar ar fhealsúnacht, ar pholaitíocht agus ar eacnamaíocht. Rugadh Stephen don lánúin ar dtús. Ansin bhí beirt iníon acu, Philippa agus Mary, agus d'uchtaigh siad Edward sa bhliain 1956. De réir dealraimh, clann corr aisteach ab ea iad. Chuir Frank agus Isobel an-bhéim ar oideachas, ach níor thaitin an bhunscoil mórán le Hawking. Ní raibh a ghráid thar mholadh beirte go dtí go raibh sé ina dhéagóir. B'ansin a bhuail sé le Dikran Tahta, múinteoir mata a thug spreagadh dó, agus thosaigh sé ag léiriú an-chumas sa mhata agus sna hábhair eolaíochta. "Einstein" an leasainm a chuir a chomhscoláirí air. Dé réir a chéile, shantaigh Hawking staidéar a dhéanamh ar mhata san ollscoil, ach ba mhian lena athair go ndéanfadh sé staidéar ar leigheas. Ní raibh cúrsa mata ar fáil in Ollscoil Oxford ag an am áfach, agus mar sin, shocraigh Stephen cúrsa a dhéanamh san fhisic agus sa cheimic. Bronnadh scoláireacht air, tar éis dó beagnach marcanna iomlána a fháil sa scrúdú fisice i mí an Mhárta 1959. Bhí uaigneas, cumha agus leadrán ar Stephen agus é sa chéad bhliain in Ollscoil Oxford. Cheap sé go raibh an t-ábhar acadúil i bhfad róshimplí. Chun cuidiú leis buaileadh le cairde nua, fuair sé áit mar liagóir (coxswain) ar fhoireann rámhaíochta na hollscoile. Spórt tábhachtach comórtasach ab ea é, agus d'éirigh sé cairdiúil le cuid mhór daoine mar gheall ar a áit ar an bhfoireann. Bhain míbhuntáistí leis sin áfach, mar b'iomaí uair a bhí sé buartha go gcuirfeadh an traenáil (sé huaire sa tseachtain) isteach ar a chuid staidéar. Ní raibh sé mícheart. Níor chaith sé ach míle uair ag staidéar taobh istigh de thrí bhliain a fhochéime, agus bhí an-imní air an oíche roimh an scrúdú deireanach. Lá na scrúduithe, níor bhac sé le ceisteanna a bhí ag iarraidh freagraí fíorasacha, ach leis na ceisteanna teoirice fisice amháin. Rogha dhainséarach é seo, mar shantaigh sé staidéar a dhéanamh ar an gcosmeolaíocht in Ollscoil Cambridge, agus bhí céim céad onóracha uaidh mar choinníoll iontrála. Nuair a tháinig na torthaí amach, bhí a mharcanna díreach idir céim céad onóracha agus céim dara honóracha. Bhí air Viva (scrúdú cainte) a dhéanamh, rud a chuir an-imní air, mar chreid sé go raibh sé ina mhac léinn achrannach leisciúil, i súile a léachtóirí. Sa Viva, cuireadh ceist air faoina chuid pleananna don todhchaí agus d’fhreagair sé: “Má thugann sibh céim céad onóracha dom, rachaidh mé go Cambridge. Má fhaighim céim dara honóracha, fanfaidh mé in Oxford. Mar sin, ceapaim go dtabharfaidh sibh céim céad onóracha dom.“ Bhí a fhios ag na scrúdaitheoirí go raibh siad ag plé le duine a bhí i bhfad níos acadúla ná iadsan, agus i ndiaidh dó céim céad onóracha a fháil, chuir sé tús lena chuid staidéir iarchéime i Halla na Tríonóide, Cambridge i mí Mheáin Fhómhair 1962. Bliain dheacair ab ea 1963 do Hawking áfach. Ar dtús, bhí díomá air go raibh sé ag obair leis an gcosmeolaí Dennis William Sciama, in ionad an réalteolaí cháiliúil Fred Hoyle. Ní raibh Stephen sásta lena chuid thraenáil sa Mhata ach oiread. Ní leor é dá chuid oibre sa chosmeolaíocht nó sa choibhneasacht ghinearálta. Ach, dáiríre, b’shin an chloch ba lú ar a phaidrín. Thosaigh a chuid sláinte ag trá. D’éirigh sé an-chiotach, bhí deacrachtaí aige agus é ag rámhaíocht, tháinig mungailt ina chuid cainte agus uair amháin, thit sé síos staighre san ollscoil ag buaileadh a cheann go dona. An Nollaig sin, thóg a chlann chuig an dochtúir é, agus cuireadh tús le himscrúduithe leighis. Agus é aon bhliain is fiche d'aois, fuarthas amach go raibh galar néarón luadrach air. Dúradh leis nach mbeadh níos mó ná dhá bhliain fágtha aige ar an saol seo. Thit Hawking isteach in umar na haimléise, agus ag am amháin, bhí sé ar tí stop a chur lena chuid staidéar. Ach níor mhair an fhéintrua. San ospidéal, chonaic sé buachaill óg ag fáil bháis ó leoicéime, agus gan mhoill, tháinig athrú intinne air. Dhá bhliain ina dhiaidh sin, bhí sé pósta, bhí tráchtaireacht scríofa aige ar dhúphoill, bhí Ph.D bainte amach aige agus bhí post faighte aige mar léachtóir i gCambridge. Taispeánann an pictiúr seo déréalta atá comhdhéanta as gnáthréalta agus dúpholl. Cara le deirfiúr Hawking ba ea Jane Wilde. Bhuail sí le Stephen den chéad uair ag cóisir Chinn Bliana i 1962, agus tamall ina dhiaidh sin, thosaigh siad ag siúl amach le chéile. Chuidigh sí go mór leis nuair a bhuaileadh tinn é, agus i mí Dheireadh Fómhair 1964, bhí siad idir dáil agus pósadh. Dúirt Hawking féin gur thug an cleamhnas dóchas sa saol dó, agus pósadh iad ar an 14ú Iúil 1965. Rugadh mac dóibh, Robert, sa bhliain 1967, tháinig Lucy ar an saol sa bhliain 1970, agus saolaíodh Timothy sa bhliain 1979. Fuair Hawking post in Pasadena, California sa bhliain 1974. Faoin am seo, bhí sé i gcathaoir rotha. Ní raibh sé in ann scríobh níos mó. Bhí an t-uafás brú ar Jane mar gheall ar chúram na bpáistí agus a fhir chéile. Ba mhian léi cuireadh a thabhairt do mhac léinn iarchéime teacht chun cónaí leo chun cabhrú le cúram Stephen. D’aontaigh sé glacadh leis seo. Bernard Carr a rinne an post seo ar dtús, agus Don Page an dara duine, ar theacht abhaile dóibh ó Pasadena. Bhí níos mó ama ag Jane di féin ansin, agus thosaigh sí ag canadh i gcór áitiúil. I mí na Nollag 1977, bhuail sí leis an orgánaí Jonathan Hellyer Jones, agus d’éirigh sé an-chairdiúil léi agus lena clann. Deich mbliana níos déanaí, bhí Jane agus Jonathan i ngrá le chéile. De réir dealraimh, ghlac Stephen Hawking leis seo agus bhí sé tuisceanach faoi, ar choinníoll go leanfadh sí ar aghaidh ag taispeáint cion agus grá dó freisin. Ní raibh sé i gceist ag Jane nó ag Hellyer Jones an teaghlach a bhriseadh suas áfach, agus ar feadh na mblianta, ní raibh eatarthu ach grá platónach. Ag deireadh na seachtóidí, tháinig meath ollmhór ar chumas cainte Stephen. Níor thuig ach a chlann agus a bhuanchairde é. D’aistrigh siad a chuid focail do dhaoine eile, agus bhí frustrachas orthu go léir. híchumas. Ach ní raibh croí Stephen istigh sa sórt oibre seo. Bhí sé i gcónaí ag iarraidh deighilt a chur idir é féin agus a chuid deacrachtaí fisiceacha. I lár na hochtóidí, tháinig drochniúmóine air. Bhí sé i mbaol a bháis, agus ag am amháin, moladh do Jane deireadh a chur lena thacaíocht beatha. Dhiúltaigh sí, agus rinneadh traicéastóime air. Chiallaigh sin nach mbeadh Stephen in ann labhairt go deo arís agus go mbeadh buanchúram uathu. Fostaíodh banaltraí do na trí sheal oibre sa ló a bhí de dhíth. Elaine Mason an t-ainm a bhí ar dhuine acu. Chun cumarsáid a dhéanamh, bhí ar Stephen a mhalaí a ardú chun litreacha ón aibítir a roghnú ó chárta liteartha. Ach ansin, d’úsáid sé clár ríomhaire dar teideal an "Equalizer" a fuair sé ó Walt Woltosz. Ó shin i leith úsáideann sé cnaipe ar a chathaoir rotha, chun frásaí, focail, nó litreacha a roghnú ó stóras 2500–3000 atá réamhscanta. Saor ó bheith ag brath ar dhaoine chun labhairt dó, dúirt Hawking: "I can communicate better now than before I lost my voice." Leis an modh cumarsáide seo, bhí Stephen in ann léachtaí a ullmhú roimh ré. Ach bhí fadhbanna eile le sárú aige ansin. Bhí tuairimí an-difriúil ag an mbeirt faoi chúrsaí reiligiúin freisin. Bhí creidimh láidir Críostúil ag Jane, ach ní raibh ag Stephen, rud a chruthaigh teannas sa ghaol eatarthu. D'admhaígh sé go poiblí gur aindiachaí ba ea é.
Ag deireadh na 1980idí, bhí dlúthchairdeas tar éis fás idir Stephen agus Elaine Mason, banaltra dá chuid. 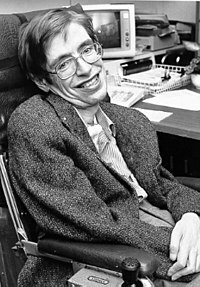 Chuir a pearsantacht, a ceanndánacht agus a cosantacht imní mhór ar chlann agus ar chairde Hawking, ach níor éist Stephen leo. I mí Feabhra 1990, d’inis Stephen do Jane go raibh sé ag scaradh uaithi, chun a bheith le Mason. D’fhág sé teach a mhuintire, agus tar éis dó colscaradh a fháil ó Jane sa bhliain 1995, phós sé Mason, ag rá "It's wonderful—I have married the woman I love." Chuir an pósadh seo brón agus uaigneas ar theaghlach Stephen, a mhothaigh díbeartha agus imeallaithe uaidh. Tháinig an imní orthu, go háirithe sna blianta ag tús na mílaoise, nuair a chreid siad féin agus a fhoireann leighis go raibh sé ag fulaingt de bharr mí-úsáid chorpartha. Chuaigh na póilíní i mbun fiosrúcháin, ach chuir Hawking stop leo, agus dúnadh an Cháisc nuair a dhiúltaigh Stephen ráiteas a thabhairt nó gearán dhéanamh. Go ciúin sa bhliain 2006, fuair Stephen colscaradh ó Mason, agus d’athbhunaigh sé an dlúthghaol le Jane, lena pháistí agus lena gharpháistí. Sa bhliain 2005, tháinig meath níos measa ar shláinte Hawking. B’iomaí uair nach raibh sé ábalta análú i gceart. Bhí aerálaí uaidh go minic, agus chaith sé go leor tréimhse difriúla san ospidéal. D’éirigh rudaí níos measa fós nuair a chaill sé cumhacht a mhéara. Ach lean sé ar aghaidh go cróga misniúil agus thosaigh sé ag úsáid matán ina leiceann chun cumarsáid a dhéanamh tríd an ríomhaire. Ní raibh sé in ann ach focal amháin sa nóiméad a chur in iúl áfach. Leis seo, bhí dainséar ann go dtiocfadh bréagchóma nó siondróim iniata air. Mar sin, d’oibrigh Hawking le saineolaithe agus le taighdeoirí ar chórais nua a n-aistreoidh patrúin a inchinne nó a ghothaí gnúise go focail. Bhí dul chun cinn mór déanta aige le hIntel, agus cruthaíodh an aip ‘Swiftkey’ dó, a chabhraíonn leis agus le daoine eile atá ag fulaingt ó Phairilis. Bhí sé mar mhaoirseoir do 39 mac léinn PhD. D’éirigh sé as a phost mar Ollamh Lucasian an Mhata sa bhliain 2009 (post a bhí ag Isaac Newton tráth). D'fhan sé ag obair i gCambridge mar stiúrthóir taighde i réimse an Mhata Fheidhmigh agus na Fisice Teoirice. A Briefer History of Time (Stair Níos Giorra an Ama, 2005). Bhí go leor tuairimí aige faoi chúrsaí polaitiúla freisin. Tugann sé tacaíocht do Pháirtí an Lucht Oibre, agus vótáil sé d’Al Gore i dtoghchán 2000. D’ainmnigh sé ‘coir chogaidh’ ar ionradh na hIaráice sa bhliain 2003. Rinne sé baghcat ar chomhdháil in Iosrael mar gheall ar pholasaithe Iosrael i leith muintir na Palaistíne. Chuaigh sé i mbun feachtais ar son dí-armáil núicléach. Léirigh sé tacaíocht do thaighde gaschille agus do chúram sláinte uilíoch. Impíonn sé ar Rialtais dhomhanda dul i ngleic le hathrú aeráide. I mí Mheáin Fhómhair 2013, thug sé tacaíocht do dhaoine a bhí ag troid ar son reachtaíochta i leith féinmharaithe cuidithe do dhaoine le tinneas foirceanta. Sa bhliain 2014, vótáil sé in aghaidh neamhspleáchas na hAlban sa reifreann. Sna nóchaidí, faoi dheireadh, ghlac Hawking ról mar eiseamláir do dhaoine faoi mhíchumas. Thug sé go leor léachtaí agus ghlac sé páirt i neart gníomhaíocht tiomsaithe airgid. Chun dúil an phobail a mhúscailt sa spáseitilt, agus chun fiúntas daoine faoi mhíchumas a léiriú, sa bhliain 2007, rinne sé eitilt domhaintharraingt nialais i "Vomit Comet". I mí Lúnasa 2012, D’aithris Hawking an phíosa "Enlightenment" i searmanas oscailte Chluichí Parailimpeacha an tSamhraidh. 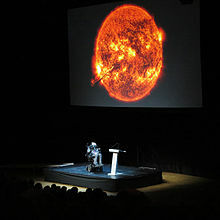 D’eisíodh scannán dírbheathaisnéiseach Hawking sa bhliain 2013. Ghlac sé le dúshlán an bhuicéid oighir i mí Lúnasa 2014 chun feasacht faoi Ghalar néarón luadrach a chur chun tosaigh agus chun airgead a bhailiú le haghaidh tuilleadh taighde. Mar gheall ar an niúmóine a bhí air i 2013, caitheadh an t-oighear ar a pháistí ina áit. Bhí Hawking le feiceáil mar aoi sa chlár Futurama agus The Big Bang Theory. Bhí ról aige i bhfógraí teilifíse chomh maith, ag fógairt cathaoireacha rotha, National Savings, British Telecom, Specsavers, Egg Banking, agus Go Compare. Mar gheall ar mhéid na cruinne, is dóigh leis go bhfuil seans maith ann go maireann neacha neamhshaolta, ach creideann sé gur chóir dúinn teagmháil leo a sheachaint. Measann sé freisin go mbeidh ról nach beag ag intleacht shaorga i gcinniúint an chine dhaonna a stiúradh, san am atá romhainn, ach gur chóir dúinn a bheith iontach cúramach ar fad leis. Ceapann sé go bhfuil an domhan i mbaol, mar gheall ar ‘cogadh tobann núicléach, víreas atá cruthaithe ag innealtóireacht ghéiniteach, nó contúirt eile nár smaoinigh muid air go fóill.’ Bhí Stephen buartha faoina todhchaí, gan aon agó. Sa bhliain 2006, chuir sé ceist oscailte ar an Idirlíon, "In a world that is in chaos politically, socially and environmentally, how can the human race sustain another 100 years?" Mí níos déanaí, b’é seo an freagra a thug sé: "I don’t know the answer. That is why I asked the question, to get people to think about it, and to be aware of the dangers we now face." Chreid sé go raibh an spáseitilt agus coilíniú sa spás riachtanach chun cinniúnt an chine dhaonna a chinntiú. D'éag Hawkins ar an 14 Márta 2018 i gCambridge. Fuair sé bás suaimhneach de réir a mhuintire, gan aon mhionsonraí a thabhairt faoi. Tá sé deacair cur síos a dhéanamh ar an méid oibre a bhí déanta ag Hawkins ina shaol an méid leabhair, aistí agus tráchtaireachtaí atá scríofa aige an méid díospóireachtaí a bhí aige le heolaithe eile an méid léachtaí atá tugtha aige an méid taistil atá déanta aige nó an méid gradam a bhí buaite aige. Ach ba shaoi gan aon agó é. Bhí meas mór tuillte aige mar gheall ar a acadúlacht agus a meon láidir ceanndána, a sháraíonn deacrachtaí a bhrisfeadh an gnáthdhuine. ↑ ag rá: "We are each free to believe what we want and it is my view that the simplest explanation is there is no God. No one created the universe and no one directs our fate. This leads me to a profound realization. There is probably no heaven, and no afterlife either. We have this one life to appreciate the grand design of the universe, and for that, I am extremely grateful." ↑ "Stephen Hawking, Who Examined the Universe and Explained Black Holes, Dies at 76". The New York Times. Tugadh an leathanach seo cothrom le dáta an 20 Feabhra 2019 ag 03:45.